After losing the power struggle to Joseph Stalin, Leo Trotsky found himself in harsh position. Soviet intelligence in the 1930-50’s was never afraid of eliminating problematic politicians with murder. We recall stories of three people, from a White Army general to a Ukrainian nationalist leader, who were killed by Soviet agents abroad. “There will be no mercy towards spies and betrayers of the Motherland,” said the title of an article in the state-run newspaper, Bolshevik, in 1937. That phrase could as well be the motto of the Soviet secret services, with “betrayers” meaning anyone whose actions somehow harm the Communist Party and the interests of its almighty leaders. Soviet spies spared no effort or money to exterminate “enemies of the state,” even if they lived far from Russia. This method of fighting political rivals was especially popular under Stalin’s reign, but it also persisted after his death. So, what are the most audacious murders committed abroad by Soviet assassins? Imperial Russian officer Alexander Kutepov (1882 – 1930) devoted his life to serving the monarchy, so when the October Revolution broke out in 1917 he had no doubt about which side to support. Colonel (and general-to-be) Kutepov became one of the leading commanders in the White Army which unified the anti-Bolshevik forces during the Civil War (1917-1922). But his talents did not keep the White Movement from failure, and in 1920 he fled Russia for Europe. Kutepov’s crusade against Communism continued, however, and in 1929 he became chairman of the Russian All-Military Union (ROVS), an organization of White Movement émigrés eager to defeat the Bolsheviks. As ROVS chairman, Kutepov organized terrorist attacks in the USSR, such as an explosion in Leningrad’s Central Club of the Communist Party. Not surprisingly, officers from OGPU (Joint State Political Directorate) decided to strike back. The circumstances are still not clear as to what exactly happened to Kutepov, (and all official information remains classified), but he was last seen alive in Paris on Jan. 26, 1930. According to the memoirs of Pavel Sudoplatov, a former Soviet spy, two agents dressed as French policemen stopped Kutepov on the street and led him to a car. After hearing Russian speech Kutepov started to struggle and suddenly died of a heart attack. Another version claims that the agents trying to kidnap Kutepov accidentally gave him too much morphine, causing his death. During the Civil War, Leon Trotsky (1879 – 1940), a long-time Bolshevik leader and talented commander who founded the Red Army, was often referred to as the second man in the Party (after Vladimir Lenin). Trotsky’s popularity and influence seemed to be unassailable, but time proved this wrong. After Lenin’s death in 1924, Stalin slowly squeezed Trotsky’s supporters out of the government and concentrated all power in his hands. In 1927, Trotsky was expelled from the Communist Party, and soon after he was exiled from the USSR. With one European country after another rejecting him under pressure from Stalin, Trotsky ended up on the other side of the world, in Mexico. But Stalin soon realized that letting his archenemy flee the country was a mistake. Even in exile, the restless Trotsky continued to publish books and articles denouncing Stalin’s regime as perverting the ideals of Marxism and revolution; he was also trying to create a worldwide anti-Stalinist socialist movement. So Stalin decided to get rid of his opponent. Pavel Sudoplatov, deputy director of the foreign department of the NKVD, planned the assassination: a Spanish Stalinist Ramón Mercader, pretending to be Trotsky’s admirer, gained access to his inner circle and often visited his house in Coyoacán. On Aug. 20, 1940, they were left alone in a room, which was when Mercader made his move. While Trotsky bent over the table to take a closer look at a paper that Mercader had brought, he struck Trotsky with an ice ax, fatally wounding him. 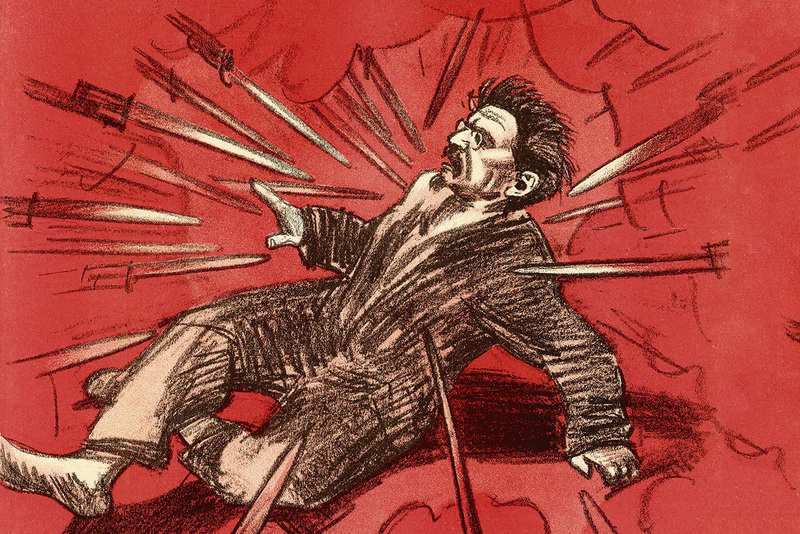 Though the wound in his head was about 7 centimeters deep, Trotsky managed to live for almost a day after that. The guards subdued Mercader and eventually he was sentenced to 20 years in a Mexican prison where he stayed until 1960. After his release, Mercader moved to the USSR, and authorities awarded him the medal, Hero of the Soviet Union. He eventually died of sarcoma and is buried in Moscow. Even today Stepan Bandera (1909 – 1959) remains one of the most controversial figures in the post-Soviet region. Many Ukrainians see him as a freedom fighter who led anti-Polish and anti-Soviet movements in Western Ukraine in the 1920s-1930s. Many others in both Ukraine and Russia, especially those supporting the Soviet past, condemn him for collaboration with the Nazis during World War II and his massacres of innocent civilians. One thing is certain - he was an adamant foe of the USSR. In the early 1950s, Bandera, who was once a prisoner in the Sachsenhausen concentration camp, settled down in Munich where he cooperated with Western intelligence agencies because he hoped to destroy Communism and free Ukraine. He had already been the target of several assassination attempts, so his supporters begged him to leave the city for a while. Bandera agreed, but before leaving he faced one final attempt which was successful. On Oct. 15, 1959, KGB agent Bohdan Stashinsky had set an ambush for Bandera in the entrance of his building, and was holding a syringe gun loaded with cyanide hidden in a folded newspaper. “What are you doing here?” Bandera asked Stashinsky, who shot him dead right through the newspaper. Ironically, two years later Stashinsky, who managed to escape the crime scene, defected to Western Germany with his wife and asked for political asylum. He confessed to murdering Bandera and served four years in prison. Soviet censorship: How did the USSR control the public?